These musicians from the Indianapolis Symphony are playing the first movement of the Dvorak American Quartet in my favorite part of the Indianapolis Museum of Art (the Dvorak begins at 1' 48"). Pay close attention to the stunningly-beautiful paintings by local artist T.C. Steele that are shown onscreen during the piece, particularly "Pleasant Run" at 2' 03". Oh how I wish they put some Inness, one of the most Dvorak (to use his name as an adjective) of 19th-century American painters, in the mix (his paintings, like this one, hang in other galleries of the museum). This article in today's New York Times suggests that Beethoven didn't have any more lead in his hair or skull than any other 56-year-old, and that lead poisoning was probably not the cause of his death. My hunch is that he died of an infection resulting from one of his abdominal taps. I thought I'd clue y'all into an interesting blog-to-blog discussion about the "perpetual problem" of finding an audience for classical music, or leading a horse to water (yeah--you can lead a whore to culture, but you can't make her think). Here is what Ron Spigelman has to say, and A.C. Douglas' reply. This discussion is guaranteed to raise your "oy-er." A few years ago I made a post about learning to play the recorder, and due to the magic and power of the link, I won't have to repeat myself here. I have kept my recorder playing up (to a point) by playing in an early music consort (though I switch between recorder and viola d'amore, favoring the viola d'amore because of its ability to play parts that go beyond the ranges of the various recorders we use). I have devoted the past few (well, seventeen) years to the violin and the viola, and haven't actually practiced the recorder during most of that time. I have the great fortune to be performing a piece by George Hunter for recorder, viola d'amore, and viola at the upcoming viola d'amore congress that is taking place in Evanston, Illinois this June. I'm playing the recorder part. The recorder part of the piece is not particularly difficult, so I have been spending a nice chunk each day practicing recorder music that is difficult, just because I can. It is a hoot to switch back and forth from alto recorder to viola d'amore (using three clefs, sometimes). Perhaps I enjoy it so much because my brain has to engage itself so differently to play those two instruments from the way it engages when I play either violin or viola. After about a month of this mishegas, I can honestly say that I have no idea how it is that I remember where to put my arms, hands, tongue, and fingers on any given instrument at any given time, but I have made considerable improvement on all four instruments. I teach people to play and to read music, but beyond the doorway I have very little idea how anyone remembers how to do anything. It is like remembering how to walk, or eat, or talk, or sleep. UPDATE: Make sure to read Michael's great post about the movie. I like to be punctual. I would say that it is one of my greatest assets. Everyone who knows me knows that I am always on time. One reason is that I always wear a watch, except when a band breaks or when a pin pops out. Today's adventures in time and space involved finding a new band (or even a band part--one of the toilet-paper-holder-like pins that holds the band in place) for my nice easy-to-read Indiglo Timex. The first jewelry store I tried didn't sell replacement watch bands, so I went to Wal-Mart and bought a utilitarian-looking leather band that came with its own "hardware." I noticed that many of the replacement bands in my size didn't have both of the pins that hold the band to the watch. I thought I had picked one with both pins intact, but I was wrong. I returned that Wal-Mart watch band, tried another jewelry store (which was closed), tried CVS (they stopped selling watches around Christmas), and then tried Walgreens (they no longer sold watches either). I tried another Wal-Mart, and found a utilitarian (the same exact utilitarian) band (the only replacement watch band they sold) with both pins intact. I was excited to take it home, but I found that it wouldn't even fit on my watch (I did use the size chart by the display). 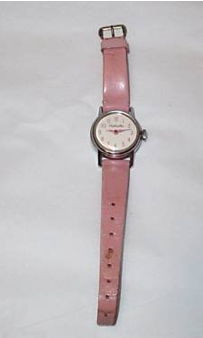 I took a scissors to a retired watch band (I keep all my old watches, including my Cinderella watch, shown above--it still works, but doesn't fit my grown-up wrist), rescued two pins, and was able to re-mount my old watch band. What is happening to the world I once knew? Do people no longer wear watches? And are those that do expected to replace the whole watch when a band breaks or a pin gets lost? I am so resigned to the realities of the musical world that I haven't made parts. Still, I would be happy to make a set of parts and send it to anyone interested in playing this piece. I had the thrill of my violin-teaching life last week when I taught Kreutzer #4 for the first time. My 16-year-old student got the hang of up-bow staccato right away, and the beauty of it all is that I didn't need to teach him anything: doing this stroke was extremely natural for him. Today, on a lark, I asked him to reverse the bowing and play the staccato notes down-bow. He did it instantly. Cleanly. Evenly. I made it clear to him that most people (like me) have to work on this stroke a great deal. He suggested that his aptitude for this might have to do with the fact that he can juggle. "Pleasant conductors are all alike; every insufferable conductor is insufferable in his own way." It probably should read "his or her own way" since everyone knows that insufferability is not an exclusively male trait. While glancing through impressions of the world according to visual artists (and the people who have decided their work is worthwhile buying, preserving, and collecting) at an art museum, I got the distinct feeling feeling that the age we are living in now could easily be considered an age of duplication. The art of printmaking has been around for centuries, and the art of photography has been around for nearly two hundred years (though projection of images through lenses has been around for longer). Reproduction, it seems, is as much a part of sharing culture as culture itself. Cultural and artistic norms help us know where a piece of pottery might have been made, when it might have been made, and, as we all learn from watching the Antiques Roadshow, pieces of pottery from particular factories have particular collectible value. People with the technique to do so would make reproductions of paintings, which is how many artists learned to paint (and still learn to paint). People with technique who want to make money can make forgeries, but you need a lot of technique to get away with it. Artists acquire technique by practice, just like musicians acquire technique by practice. My mother always said that her drawings from life were her "scales." Traveling through America in time and space, from the Hudson Valley School to the world of 1960s pop art, past pure minimalism, and into the art of "today" makes me understand a little bit about what artists and museum curators see as "representing" American life in the 21st century. So I will make a bold statement: the current trend seems to be about dealing with the recognizable, and then duplicating it, sometimes ad naseum. We marvel at the technique of assembly, the ingenuity of uniformity, and the isolation that these pieces represent--obsessive repetition within a confined space. We live in a logo-filled world. A drive down any highway, through any business district of any city (large or small) will offer the same images: the same signs, the same businesses. A trek through the internet (and I guess with an i-device, which I never use) will also offer icons that we recognize as universal. These icons are often beautiful in their simplicity. A trek through a supermarket is an equally-stimulating visual feast of logos and icons. A glance at the magazines by the checkout (and all supermarkets have them in the same place because they all follow the same blueprint) have the same celebrities on their covers. During news time on the television, the same news stories are discussed by the hosts on several different cable channels--and all the men and women seem to be wearing the same array of clothes (except Judy Woodruff on the PBS News Hour, who thrills us once in a while with something from her "Jetsons" wardrobe). A glance at a college campus will reveal young adults dressed in nearly identical clothes (though they would claim that they are wearing them because they choose to) to those of their classmates. Fashion is the art of duplication, and self-expression seems to be in accessories (what kind of skin you have on your cell phone, perhaps, or which designer or faux-designer purse you carry). Why shouldn't "officially-sanctioned" art reflect this cookie-cutter world? A lot of "officially-sanctioned" music certainly does. This article discusses the connection that hand clapping songs have with all kinds of development in children, from the social to the musical. A YouTube search revealed that the repertoire has changed a great deal since I was a kid. "The Spades," for example, was nowhere to be found, except for two words that served as an introduction to another "updated" chant (I remember that "The Spades," a camp favorite, had some truly complicated motions). My search also revealed that this seems to be an activity done mostly by girls (at least in public). I wonder why? Here are some hand clapping rhymes and jump rope rhymes from my neck of the Midwestern woods (somewhere around Terre Haute, Indiana, I believe). I know that #4 is George Hunter, but identities of the rest of these people standing behind Paul Hindemith somewhere around the Yale Campus are a mystery. Please leave your guesses in the comments, and let's use all the brain power of the musical internet to identify these composers! UPDATE: Helen Boatwright (now 93) confirmed that #1 is her late husband Howard. She also identified #5 as John Cowell. Robert Hickok is confirmed as #7 (by Hickok himself) and he confirmed that #8 is Anthony Barbieri. 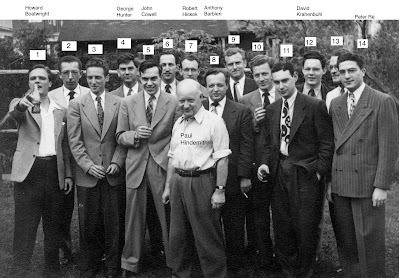 Donald Keats, who was at the Yale School of Music from 1946 to 1949 informed us that David Kraenbuhl is #12, and thinks that # 6 is Carl Miller. He only guesses that #11 might be Lennie Sarason. #10 is a real puzzle: He has Benjamin Britten's hair and build, but a slightly different face! UPDATE QUERY: Does anyone reading this think that #2 might be Donald Keats? UPDATE: Here are two more photos! I just learned (by way of a comment on another post) that Amanda Maier's E minor Piano Quartet, a piece she wrote in 1891, will be published for the very first time by Donemus in the Netherlands. Since the publication is still forthcoming, Maier is not yet on their list of published composers. I'm hoping that within a year the piece will be performed all over the world and will be recorded by excellent musicians. Spread the word, and bookmark the publisher. Michael and I vaguely remembered that The Lives of Others won scores of awards in 2006 and 2007, but we had no idea how crucial music (playing it and about listening to it) was to the film. The clip below is the central life-changing moment of the film. If you don't want to have anything of the plot given away (highly recommended), scroll over to the one-minute mark and stop when the piece is over (at 2' 10"). Sebastian Koch, the actor who plays the piano piece, practiced four hours a day for six weeks to be able to play this piece by Gabriel Yared. Do re me fa sol la ti dopamine! We all need rewards of some kind of other, and when we don't get a reward from the person or entity we desire one from, most of us seek out other means. Perhaps that's why some people spend inordinate amounts of time developing enough technique to play in a way that can be self-rewarding. Perhaps that's why some people spend inordinate amounts of time writing music: hours and hours of time for the reward of a minute or two of music that works. Some of us pretend to exist on self-rewards. Sometimes we fool people. Sometimes we can even fool ourselves, but the deception doesn't last. Most of us need rewards on a regular basis. Perhaps we crave cadences, because each one is a reward. Each cadence is a journey (of varying length and landscape) from instability to stability. Perhaps that's why tonality has survived for so long, and why it will continue to survive--even to thrive. Rhymes are rewarding. Snappy rhymes plus music with strong cadences equals popular music. And there's nothing wrong with liking music that is popular, or music that once was popular. Consider Verdi, consider Gilbert and Sullivan, consider George and Ira Gershwin, and consider Cole Porter. If I listen to well-performed tonal music when I'm feeling down, I magically feel a bit better, at least while I'm listening. Thanks Emily for pointing the way to this, and thanks to Jason for making it. It's about time someone, even if it is in the form of a hypothetical animated discussion, told the truth about the attitude and practices you find in non-conservatory musical higher education. I love the Haydn Opus 33 quartets. 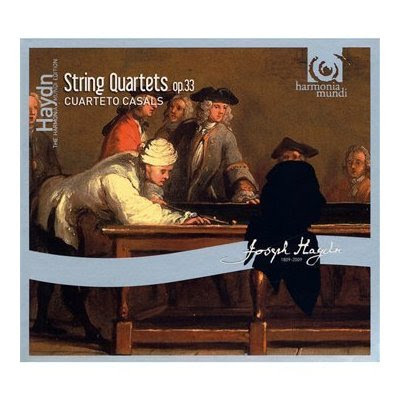 They were my first personal encounter with Haydn as a string player, and it wasn't long after starting to rehearse them that I began to think about trying to write for string quartet (the first step on my own journey as a composer). They were a true gateway drug for me, and the above recording made by the Cuarteto Casals that I have been listening to renews all my admiration for these pieces. Or maybe its obsession. This is my favorite recording to date of Opus 33, and I thought I'd share it here. The liner notes mention that Haydn wrote these quartets almost ten years after writing his Opus 20 Quartets. I like to think that Titz had something to do with his return to writing string quartets. These musicians play the Opus 33 Quartets like dramatic works--wordless operas with plots, sub-plots, comic relief, deep pathos, and lots of characters (as well as lots of character). Haydn (reportedly) was not crazy about writing operas. He was good at it (of course--he was Haydn and he was a pro), but it seems he didn't think much of himself as an opera composer. But like a brilliant mime, he could convey every dramatic nuance he wanted (and then some) without words. Perhaps it was, in part, the operatic quality of these Quartets that impressed Mozart (who did enjoy writing operas) enough to come out of his own 8-year-string-quartet hiatus, and write a set of six quartets himself (and dedicate them to the great composer who inspired him). It seems that the first time Mozart and Haydn met was when they read the "Haydn" Quartets together. The rest is history. Finally! After years of searching I found the song I loved most from my all city elementary school chorus. Yes. Back in 1968, when I was in the fifth grade, we sang this Hugo Wolf song. These are what I remember of the English words we used for the song (I'm putting them here just in case someone else might be searching). Over hill and dale and through the woods my path. As when first the universe was created. The director of the chorus was the "head" of the music programs for all the schools in Newton, Massachusetts. He spent his Tuesday afternoons with an auditorium full of fifth and sixth graders, teaching us music that we would never forget: Johnny Schmoker (in German), Windy, Kites are Fun, this arrangement of the Solfeggio Song (that Michael told me was used in a skit on the Ernie Kovacs show), and a few other pieces that I have (sadly) forgotten. I have also forgotten the surname of our director, but his first name was John. A few years later, when I became a Boston Symphony Orchestra concert-going teenager, I saw him regularly at Symphony Hall. I would say hello to him, and he was always very kind. I wonder if he knows how much those songs he taught us meant to me and my fellow urchins (many who are now professional musicians)? I have always had friends who were a great deal older than me. Actually, I found that when I was growing up I had more to talk about with people in my parents' generation than with people in my own generation. 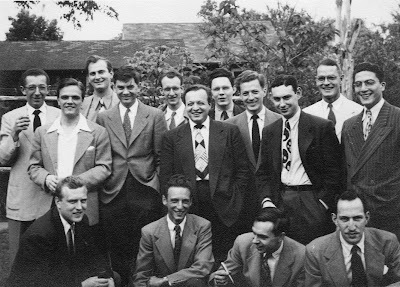 Sometimes talking with really old people--people who were from my grandparents' generation--was interesting, but my relationships with people born in the first decade of the 20th century seemed mostly like the exchange of information rather than an exchange of ideas. There was, I suppose, far too much distance between me and most of them, both in time and in culture. I still feel a great connection with music lovers and musicians who were born between the 1920s and the 1940s. Many of my musical friends who are now in their 70s and 80s are forward-thinking and generous. Many have learned to adjust to progress, and until recently, with the flowering of so many ways to communicate (and the all-too-fast development of tools that become obsolete before most people learn to use them), many have done their best to keep up to date. There are also a whole host of happy older adults who have no interest in using a computer, or even a DVD player, for that matter. These are the people attached to the "grey heads" that make up the larger portion of the audience for classical music. Why people who write about the economic state of "classical music" (again, as an institution, which it isn't) think that there is something wrong with concerts catering to an older audience is baffling to me. Everyone's hair turns grey eventually (unless they lose it first), and people use different parts of their lives to explore different pleasures. Many people come to like classical music later in life, and many people who come to like classical music later in life really like it, and they want to go to good concerts and buy good recordings. With good fortune, those of us who are still in young or middle adulthood will live to a nice old age and will have the time to go to a lot of concerts. I think it is time to celebrate that fact that older (and wiser) people choose to spend their time in the company of emotionally- and intellectually-challenging music, and we need to take their needs into consideration. They are, after all, members of the largest-growing segment of the population. I just learned about copyleft, and Artlibre, and my innate socialist tendencies embrace the concept (as well as the clever name and the nifty symbol). Too much of the internet is used for monetary gain, and the concept of sharing material (musical and otherwise) just for the sake of creating community seems to have faded. There are people who assume that if sheet music is offered online for free, it must not be worth much. I have a very different concept of value, particularly when it comes to my creative work. I believe that the more something is used, the more value it has. Baby clothes gain value with each child that wears them. Children's books gain value with each reading, and they don't lose value when they are passed on to other children (unless they fall apart). Musical instruments gain value with age. Written music gains value every time it is played. 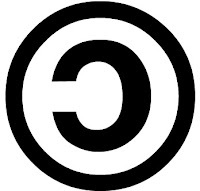 I hope that the music I write and distribute for free by way of the internet (and I promise that the pieces I have in the public domain will stay there) gains value by being played by people who want to play it. Music gains particular value when it is played by excellent musicians. I find this position empowering. The joy I get from writing music is in the writing and in the hearing. It is not in the selling (only 10% of the cover price of a commercially-published piece of music goes to a composer anyway). The time and thought that musicians put into an interpretation and/or a performance of a piece I write is ample payment for my efforts. The phrase "emerging composers" is tossed around quite a bit these days. Each time I see it in print, the image of a butterfly emerging from a cocoon comes to mind. The phrase tries to give the impression that composers "emerge" and then are released out into the world, spreading their music to all, beautifying the world like the butterfly in the sky. We all know what happens to butterflies though. Most of their life is spent in their cocoons, and their short adult life is really about mating and making more butterflies. People collect them, pin them on boards, study them, and admire them (much like they do composers, I guess), but that is where the "emerging" similarity stops. The concept of the "emerging" composer suggests that once a composer is fully formed, he or she can "emerge" into the world, perhaps to be considered successful. Believe me, any "emergence" is a total illusion, as is the idea of being fully-formed as a composer. Life for a composer (and really for anybody) is a work in progress. 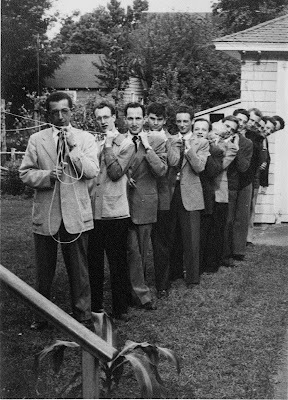 Most composers have to work (and I mean in a self-promotional, public-relational, making-connectional way) very hard at becoming known to the world outside their intimate circle of family and friends. With the right business-minded approach to the idea of selling music and getting commissions (and either the devoted man- or woman-power of a significant other to save you the problem of appearing self-promotional, or the money to pay someone outside of the family fold to do that work for you), you can have a certain degree of success. If you form your own publishing company and/or recording company, you can have a certain degree of monetary success as well. Often commercial success only has a little to do with the music a composer writes: it has a lot to do with what people say (in print or on line) about it. My personal list of well-promoted composers that impress me is far shorter than my list of well-promoted composers that don't impress me. It seems that most of the composers I admire (both living and dead) put their energies into writing music and not into the idea of promoting themselves. Many composers hate having to put time into self-promotional activities. Some just don't. Telling people (either yourself or through promotional material) that what you do is "great" serves as a real deterrent to daily work. If an honest composer writes something less than great, then he or she has essentially lied. I believe that most decent composers understand what great is, and most know (in their heart of hearts) that they can never write music halfway as good as the music they admire. Imitation is terribly obvious in music, so it is never an viable option. Schubert never "emerged." He died before anyone outside of his circle knew how great he was. Bach never "emerged." He didn't have to hustle for recognition after getting a good job, plus, he was too busy. Even Mozart never "emerged." His father started promoting him when he was barely out of the womb. Beethoven and Haydn had monarchs to champion their work. Chopin had Sand, and Brahms had Schumann (who, incidentally, wrote Papillons). For the equally-clever second movement (on ice!) and the third movement you will need to go here (I'm not as impressed by the third movement or the last movement).